If you hate peace, Christmas, and free speech I know just the town for you! Pagosa Springs, Colorado. It is just a hop, skip, and a jump from Denver (site of the latest season of the Real World...not that I watch the Real World). Why should all you haters move there? 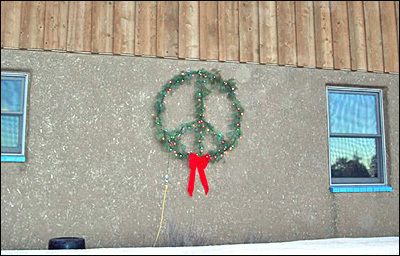 A resident of the Loma Linda subdivision of Pagosa Springs is facing up to $1,000 in fines for hanging a wreath in the shape of a peace symbol on her home (see left). The Homeowners Association ordered her to remove the wreath after receiving calls from angry residents who believe the wreath to be anti-Iraq War or even...duh duh duhhhhh...satanic. Some residents of Loma Linda have children serving in Iraq and feel that the wreath doesn't show the support that the community feels for its deployed sons and daughters. Uh, maybe I'm missing something, but if you have a child in the military, shouldn't PEACE BE THE ONE THING YOU WANT THIS CHRISTMAS?!?!? How is hoping that things calm down in the world so we can get our servicemen and women home safely ANTI-"The Troops"? Should we be hoping for more wars so the troops can have more work? More opportunities for travel to exotic locales? I'm all for having people remove things that are offensive from their property. For instance, my neighbor who had a deer head in his trash can for a few weeks until his dog got hold of it and dragged it all over the yard...definitely should have been fined. Having someone take down a symbol of peace during a time when so many groups are fighting so many wars that it is hard to keep track of who is fighting who and why they are fighting, seems a bit...I don't know...what's the word I'm looking for...rhymes with Bashist...yeah, you know the one. Guess I'll have to cancel that holiday trip I was planning to Pagosa Springs. Sigh.